LAS VEGAS, NV - At CES, HyperX had on display its new HyperX Fury RGB SSD which adds RGB LEDs to the Fury based line of drives. These drives are set to hit in Q3. HyperX showcased the new drive with its added RGB LEDs on the shell of the 7mm, 2.5-inch SATA based SSD. 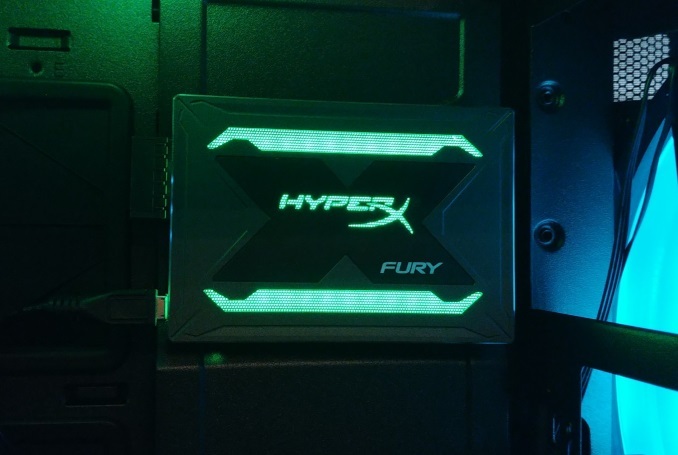 The RGB LEDs are located on the top part of the SSD with a large area above and below the large “X” lit up as well as the HyperX symbol in the middle. The RGB LEDs are powered by a micro USB port as well as using that data path to synchronize the LEDs with the system it is attached to. The HyperX Fury RGB will use Toshiba’s 3rd Generation 3D NAND/BiCS type of flash which has a far higher die area density when compared to 2D NAND as well as using less power. The drive is SATA based with speeds rated for 550 MB/s reads and 520 MB/s writes. HyperX did not share which controller it will be using. We do know the HyperX Savage line of SSDs used a Phison controller (PS3110-S10), so perhaps an updated version will make its way to the Fury RGB. There are three capacities for the drives; 240GB, 480GB, and 960GB. Pricing was not listed, but these will be available in Q3 2018.